It is raining MMORPG games and we again have something great to offer. This time it is PlaneShift – a game that gives its players the full opportunity to make an entirely new life in a fantasy world. Moreover, the detailing in the game is life-like and that is what makes it so playable and fun. The PlaneShift project has been created by a team of talented developers spread around the world that collaborate to make it a success. The project director is Luca Pancallo who looks after the major work going on behind the game. Firstly, lets have a look at the gameplay mechanism and structure. 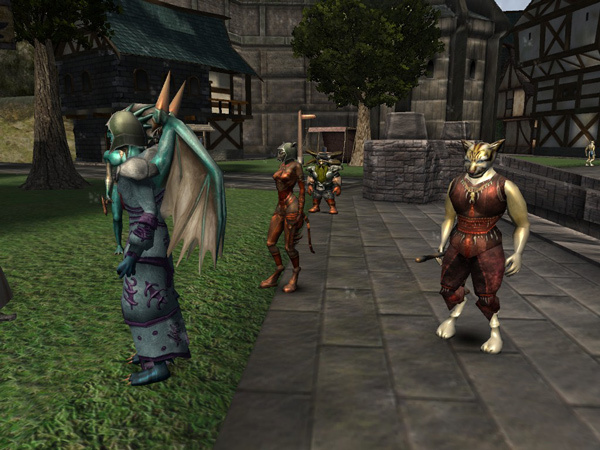 Like many MMORPG, PlaneShift allows players to customize their characters even with things that would never have been considered in most other games. Players can enter all types of details such as birth date, ancestry, and even the character they would portray. Coming to the graphics of the game, just one word comes to mind and that is – amazing. Every detail in the game is fully animated and coated with the visual delight of 3D. If you are out there looking for a good-looking MMORPG, then PlaneShift is the way to go. The game is built on the Crystal space engine, which makes the graphics so highly capable. Everything about PlaneShift feels smooth and unprecedented. The gameplay is detailed, the graphics are great, the community of players is large. All-in-all, this game should feature on every MMORPG fans desktop without the slightest doubt in mind. Haven’t gotten enough of MMORPG just yet? Here’s another one you can sink your teeth into. Planeshift is a role playing game that prides itself for providing excellent graphics, great gameplay and completely free for download. Pretty much, it has everything that an mmorpg has to have and then some. Immerse yourself into a whole new world and lead a life as a Vlian, Dermorian, Clan Hammerwielder or even as Diaboli. Planeshift is released with a GNU license and absolutely do not contain any hidden costs. Once you enter the game, you are free to pick and customize your own character. The customization is taken into another level compare to regular rpg’s. For instance, you can customize the ancestry, birth date and even the fate of your character. Make friends and also create several enemies as you go on your way. The entire game comes in 3D, hence, the graphics are nothing to complain about. Scenes and objects are beautifully rendered and pretty much detailed. For a game that is absolutely free, the graphics is definitely commercial value. On the other hand, sound effects are pretty decent. Although not exactly spectacular, they definitely add a lot of depth into your gameplay. Another thing with Planeshift that some players might find annoying while others would find liberating is that there are no maps or guides on where to go. Players must explore the town and places themselves. This includes visiting some of the most dangerous places without really knowing. Essentially, players will need to learn the game inside and out if they want to fully master and navigate through it. Overall, the game is pretty good. As mentioned, the graphics are nothing to complain about but players might get annoyed by the lack of direction once they play the game. Then again, the entire point of playing rpg is to immerse oneself in a whole new world. This includes finding out what it has to offer even if it means figuring it out the hard way.